Transformation encompasses not only the use of digital technology, but also incorporation of new systems and advancing scientific knowledge to solve seemingly insuperable problems. If we are going to transform the U. S. healthcare system, there is one overwhelming problem that must be solved: prevention of the chronic illnesses, the treatment of which consumes the vast majority of our healthcare dollars. Prevent or reverse arterial disease, diabetes and stroke and you have solved the Medicare financial crisis. The FOCUS Healthcare and Life Sciences Team recently published its Winter 2015 Healthcare and Life Sciences Report, which includes an article below outlining my personal journey into the world of chronic disease prevention. I’m republishing the article on Capital Matters at the beginning of Heart Month because a high percentage of our readers (Type A business owners, investment bankers, lawyers, et. al.) are at a risk for heart disease, America’s number one killer. I’ve had my wake up call; hopefully, by sharing my experience, I will help a friend or two avoid the damage of these preventable and perhaps reversible conditions. As an investment banker to middle-market business owners, I spend lots of time with people who’ve reached a point in their lives the marketers refer to as “mature.” They’ve worked hard all their lives, experienced their fair share of stressful events, and may have picked up “a few pounds” since they were high school sports stars. A cardiac “event” can be a life altering experience. It may even precipitate an unplanned decision to sell a business. The modern era has witnessed two great periods of transformation that radically changed the global economy and the very nature of human existence. The Industrial Revolution of the 18th and 19th centuries and the shift to a postindustrial economy over the past fifty years are old news. Today, the Global Economy is undergoing a third period of transformation into a new Digital Age that promises to be even more dramatic in its impact. In this article, we will address some of the forces driving this change and provide our predictions as to which industries and economic sectors will be affected first. For a video discussion of the topics covered in this email click here. Manufacturing dominated the American economy for almost 100 years commencing in the late 1860s, but, beginning in the 1960s, manufacturing was rapidly eclipsed by a new services and trade based economy. A quick look at the chart below demonstrates how overwhelming that trend has been. From 1850 to 2010, primary and secondary manufacturing in the United States dropped from approximately 80% of the US economic output to its current level closer to 20%. 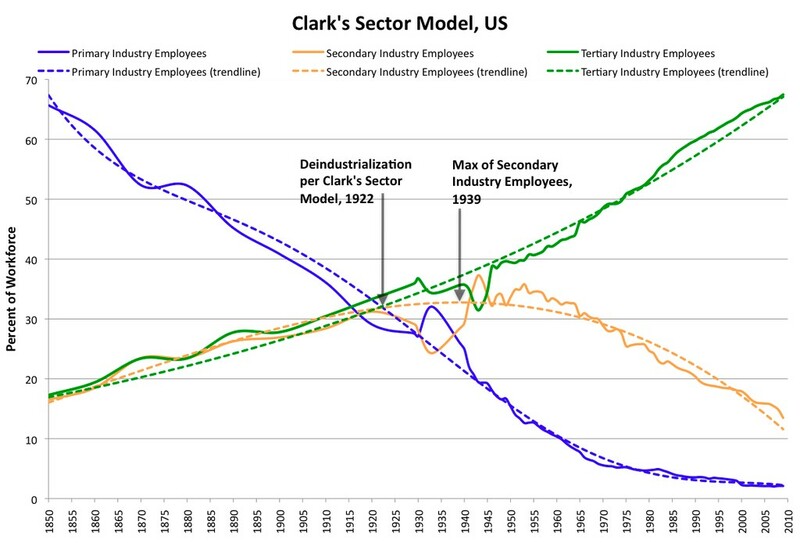 Tertiary industries, Clark’s name for what we would today call services, finance, retail, and distribution grew from approximately 17% of the economy in 1852, to 70% today, with the most important portion of this transition occurring since the 1960s. While the Industrial Revolution took almost 150 years to fully play out, the shift to a services and trade based economy happened in less than half that time.